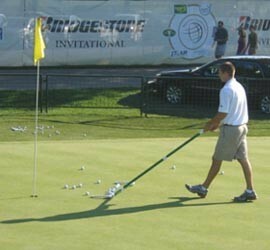 The Ball Sweeper is designed to make it easier and faster to move balls off the green. Compare it to your present ball pusher. You will see the difference! The unique patented design of the Roller Assembly along with the Rotating Handle makes it possible to clear off 60 or more balls in one pass in seconds, with very little effort. 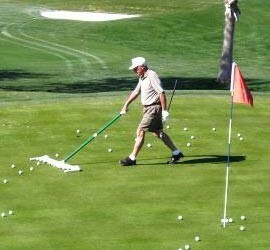 All this came about when I was practicing on our new Chipping Green at Heritage Palms back in Nov. 2006. 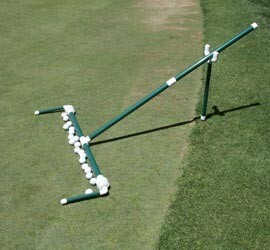 The Scorpion Ball Sweeper is designed to make it easier and faster to push golf balls off of the practice green. Have questions? Please call us at 775-843-5040 or click below to use our email form to send your message.